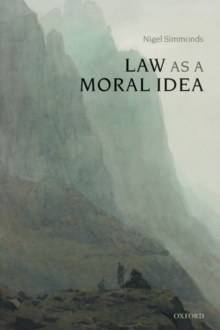 This book argues that the institutions of law, and the structures of legal thought, are to be understood by reference to a moral ideal. The idea of law is an ideal of freedom, or independence from the power of others. The moral value and justificatory force of law are not contingent upon circumstance, but intrinsic to its character as law. Doctrinal legal arguments are shaped by rival conceptions of the conditions for realisation of the idea of law. In making these claims, the author rejects the viewpoint of much contemporary legal theory, and seeks to move jurisprudence closer to an older tradition of philosophical reflection upon law, exemplified by Hobbes and Kant. Modern analytical jurisprudence has tended to view these older philosophies as confused precisely in so far as they equate an understanding of law's nature with a revelation of its moral basis. According to most contemporary legal theorists, the understanding and analysis ofexisting institutions is quite distinct from any enterprise of moral reflection. But the relationship between ideals and practices is much more intimate than this approach would suggest. Some institutions can be properly understood only when they are viewed as imperfect attempts to realise moral orpolitical ideals; and some ideals can be conceived only by reference to their expression in institutions.